Part one of a series on early childhood education explores the benefits of reading to their children. This is the digital age. Our kids are more wired than we ever were. Tablets and I-pads, smartphones, and computers are all things that compete for our attention as well as the attention of our children. It is great to have a connection to the world around us, however, sometimes, it’s a good idea to put it to the side, and make a more personal connection to your child. We’re often asked by parents “why should I read to my child?” Because it is something that will help them immensely throughout life. When you read to your children, you develop a strong relationship with them. As they grow older they’ll be much too busy. They will be out playing, exploring, establishing connections with their peers, and making friends. Reading to your children will bring you closer together, and helps to nurture both you and them. You only get one chance as a parent. Why not take it? However, it also has some surprising benefits as far as childhood development as well. It has been clinically proven by numerous studies that reading to toddlers and preschoolers makes them much more likely to do well in all areas of formal education when they enter into grade school. They will have a working knowledge of the way sentences are structured. Another way reading to your child also helps is by teaching basic speech skills. Throughout their toddler stage as well as preschool, your child is learning critical language skills. Look at Dr. Seuss books for example. As they are written in rhyme, they are great ways to teach children the differences between words. 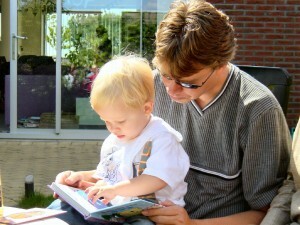 Reading to your child also helps them develop the basics of literacy. No one is born knowing that a book or a page is read from left to right and top to bottom. That is something that they learn by you reading with them, and by the right early childhood education. This concludes part one of a series on early childhood education and reading to your children. Be sure to read part two and part three as well.